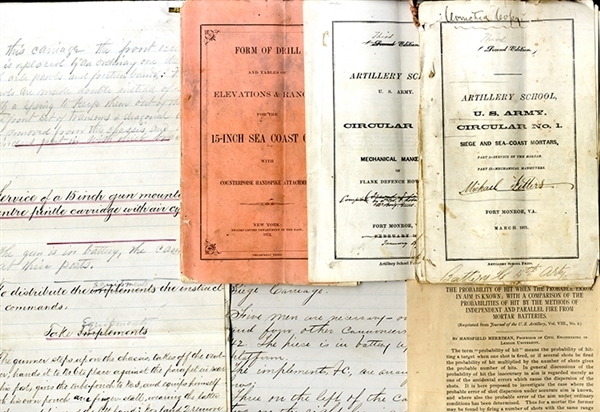 Six printed Artillery School circulars, including hand-corrected copies, five of which are signed and inscribed with endorsement by 1st Lieutenant Joseph Cabell Breckinridge (1842-1920 and cousin to CSA General John C. Breckinridge) of the 2nd US Light Artillery, from 1872-1873 at Fort Monroe, VA. Additional signatures on circulars include one by Brevet Captain James William Piper of the 5th US Light Artillery, who was brevetted for gallantry at Mechanicsville on June 26, 1862, another by Brevet Major General William F. Barry, and one by Brevet Brigadier General Joseph Roberts. Two handwritten pamphlets on the service of certain guns, with signed endorsement by Joseph Breckenridge dated January 4, 1872 and January 11, 1873, at Fort Monroe, VA.
One printed copy of Form of Drill and Tables of Elevations & Ranges for the 15-Inch Sea Coast Gun, with Counterpoise Handspike Attachment. Headquarters Department of the East: New York, 1872. Booklet includes hand-revisions, as well as signed endorsement by Joseph Cabell Breckinridge on back cover, dated January 11, 1873 at Fort Monroe, VA.
One printed copy of Charles A. L. Totten's Notes on Compensating-Powder: Being a Brief Consideration of a New Mechanico-Chemical Explosive, for Heavy Artillery Purposes. Military Department, State Agricultural College: Amherst, MA, 1877. Enclosed in which are two handwritten letters dated 1884. Three leather bound workman's journals containing progress entries on various types of artillery, including a "10" W. W. Cast Iron Rifle," a "7" Steel B. L. Howitzer," a "10" B. L. Rifle," and others. Journal covers inscribed with names of rifles. At least one journal contains entries from years 1889-1890. One reprinted article by Mansfield Merriman, from the Journal of the US Artillery. Enclosed in which are several handwritten pages of mathematical charts and drawings. Miscellaneous handwritten notes and paperwork about artillery mechanics, including one letter to the adjutants of the Artillery School. Joseph Cabell Breckinridge, Sr. (1842-1920) served the Union Army as an officer during the Civil War. Living in Kentucky, Breckenridge's family was like all too many families split apart by the great conflict. Two of his older brothers fought for the Confederacy, while he and another brother fought for the Union. He went on to become adjutant of the Artillery School at Fort Monroe in 1870, and was promoted to captaincy in 1874. He later served as Inspector General of the Army and became Major General of volunteers in the Spanish-American War. Overall expected wear with some light soiling and toning, else VG.